A Webex webinar provides a number of opportunities for interaction: one person at a time presents on screen and everyone can contribute by teleconference or a chat bar down the screen. We also used a “whiteboard” which allowed everybody to pin their location on a map (all contributors were in Scotland, from Ayrshire to Shetland). Many of us also tweeted. Tweets from the hour (n=50) are summarised in a Storify (see methods slides in the Storify for more details). The tweets could be grouped into eight main themes (plus admin tweets). These themes provide a structure for this write up of this #PublicHealthHour as a whole. Here’s a Pareto chart of the tweets. There were 112 tweets (n=49) / retweets (n=63) during the hour, by 34 participants with over 180,000 Twitter impressions (views of individual tweets). I added a further tweet posted just before the hour as it put some of the other tweets in context. 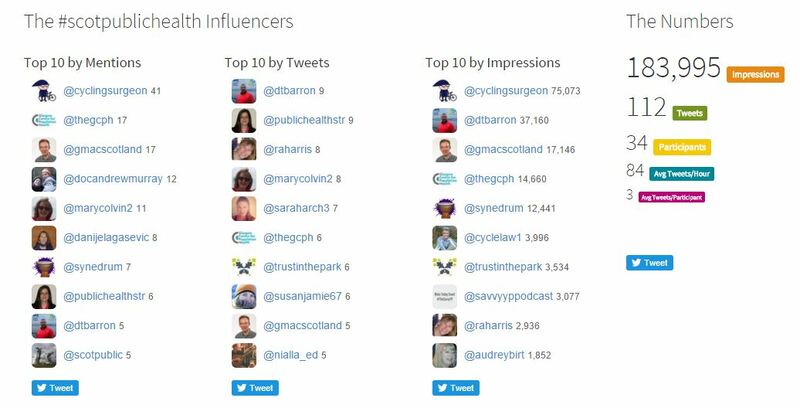 The main influencers and stats during the hour are shown below using data from Symplur. An article by Chris and Andrew Murray, on the Faculty of Medical Leadership and Management (FMLM) website Why should healthcare workers consider using Twitter? provides a succinct summary of reasons to use twitter (eg sharing information, networking, advocacy), but also how to avoid pitfalls (including GMC guidance on social media). Having a clear goal is important. Here is Chris and Andrew’s goal from the FMLM article. In the beginning, we just wanted to connect with as many runners and cyclists as we could. We thought we could be a rigorous and trustworthy information source and our initial goal was to share information and things we are passionate about. 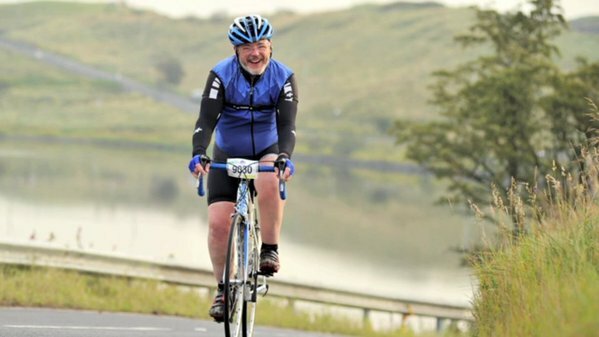 We also wanted to be a source of encouragement and support to people wanting to be more physically active through running and cycling. We asked participants in #PublicHealthHour to tweet a message sharing the link to the report, using a hashtag and image. 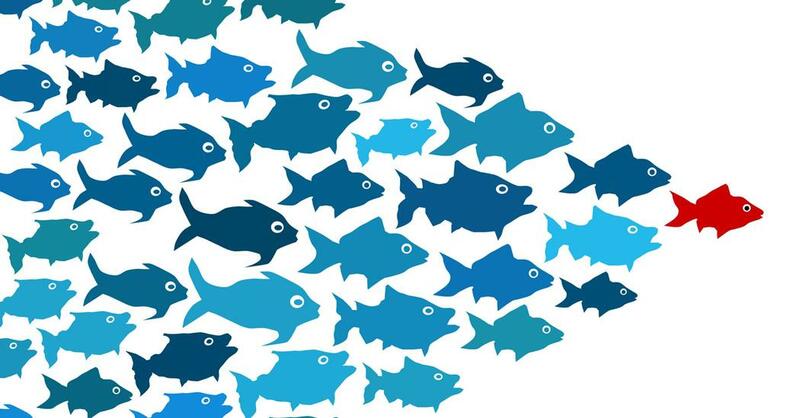 Countryside Trust (@TrustinthePark) produced an effective tweet based around an image of a shoal of fish (click image for tweet). Other techniques could be added (eg tagging people in an image). We also discussed types of image that we could use, and the need to seek permission if using images with copyright. Trevor Lakey (@SyneDrum) tweeted Glasgow Centre for Population Health’s (@theGCPH) advice on using social media. Check out the rest of their series on social media analytics, infographics (including link to free infographic software Piktochart) and blogging, with a focus on research. Derek also shared ways to collect and summarise healthcare tweeting stats: Symplur stats for tweets using #NAHSCP (@NAHSCP is North Ayrshire Health and Social Care Partnership). This is a great way to monitor visibility and reach of a network (see #ScotPublicHealth example above). Finally under the theme of social media, Josie Murray (@PublicHealthStR) posted a poll confirming that participants in #PublicHealthHour would like to have access to Twitter for work. We talked about other types of social media, and noted higher engagement with some groups via Facebook. But some patients/ clients/ patients surprise us by being users of Twitter. Funders like Twitter, so it’s important for voluntary sector and research teams to have a Twitter presence. Derek provided further thought in Webex chat: “different media for different purposes. Numerous platforms – Twitter, Facebook, G+, WordPress, Medium, Instagram, Pocket”. Derek was encouraged to share a slide after the session that illustrates this humorously with perhaps the polar opposite of physical activity – the donut (click image to see tweet). 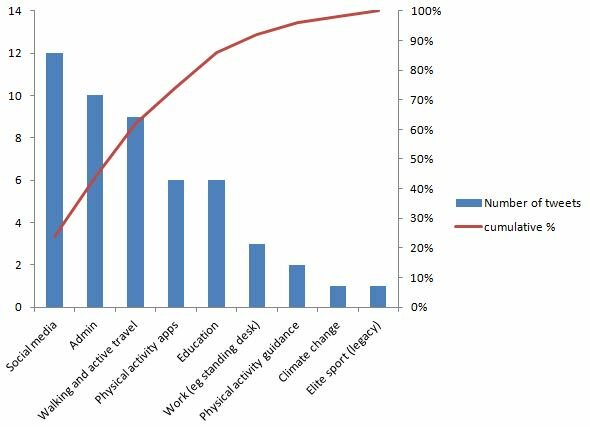 Perhaps unsurprisingly for a Public Health audience, there was much more discussion on walking, cycling and active commuting than sport. Rachel Harris (@raharris) tweeted from a GCPH session with Stuart Hay (@StreetWurrier). Stuart highlighted that the “advent of the car has led to walking being ‘designed out’ of streets“. Tools such as WalkScore (@WalkScore) show the most walkable cities and neighbourhoods across US, Australia and Canada. Environment is important for work, school and play. During the hour colleagues shared a number of very effective infographics on active travel. Click on image to see full tweet. David Hunter (@dvrh9) posted pictures of pavement obstacles (click image to see tweet), building on a theme from the January #PublicHealthHour. The message from this section was that simple steps (eg with road authorities for example above) will encourage more people to take short journeys on foot and bike, with benefits for population health and reduced pollution and congestion. We had a quick discussion about physical activity apps. Josie captured the general discussion in a tweet “activity should be driven by #activity not #technology“. Check the Storify for more. 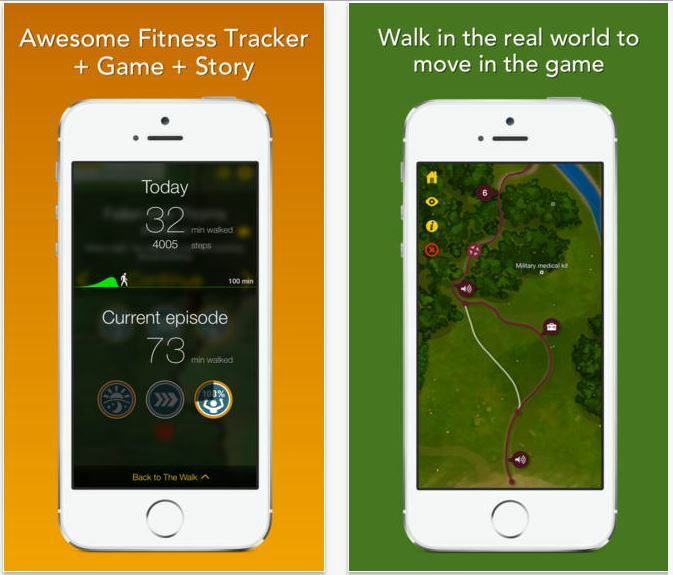 There was some Webex chat about apps too – eg mention of the NHS walking app “The Walk” (click to view on iTunes). I have no experience of this app and cannot give an opinion either way, but it’s worth knowing about it in case people ask. Twitter has a huge role in education. Following organisations like the BMJ (@bmj_latest) or The Lancet (@TheLancet), and searching by hashtag (eg #PhysicalActivity or indeed #ScotPublicHealth) can keep you up to date and well ahead of print articles. Chris told us about a new massive online open course on physical activity: “Sit Less, Get Active“. This starts in May and is free to join. We practised ways to promote this course using Twitter, and demonstrated a number of features of a good tweet live during the Webex. Click image below for the original tweet. Follow @GetActiveMOOC. Chris then showed us the impressive University of Edinburgh undergraduate physical activity resource (click image to see page – requires UoE log in). These resources are a huge step forward from previous teaching to medical students that many of the #PublicHealthHour participants remembered as undergraduates (which typically focused on traditional risk factors in public health modules – smoking, alcohol etc – rather than the positives of exercise). One of the main gripes about modern work is that we spend much of our lives sitting down. 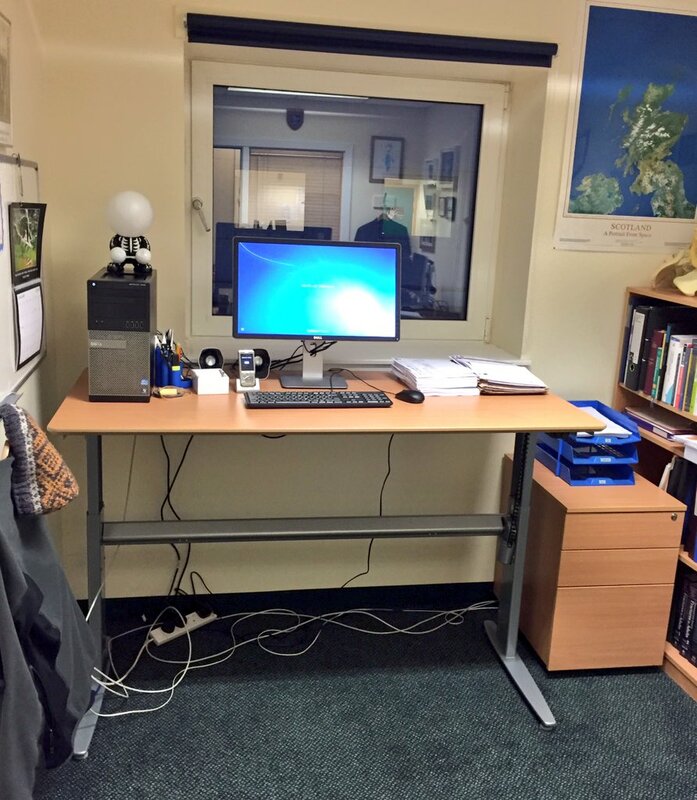 Chris showed us his standing desk (image below is from an earlier tweet). I will reflect separately about our sedentary lives another time. 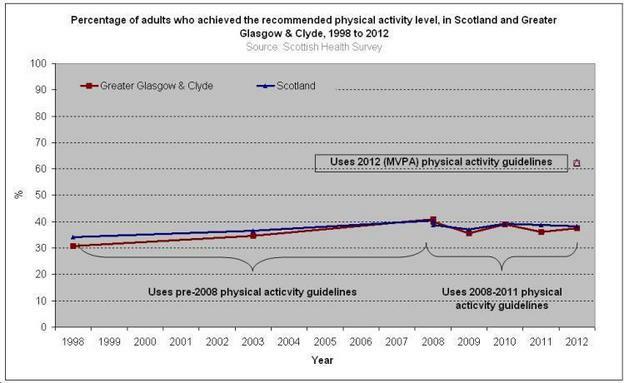 We talked a little about UK physical activity guidelines. Colleagues commented that many people do not know the guidance for different age groups. I asked participants if they could source information and tweet about the advice for under 5 year olds. Niall Anderson (@NiallA_Ed) found a helpful link and tweeted about it. Click image to see tweet. See results of more recent Twitter poll (answer = 3 hours/ day – majority guessed lower). GCPH tweeted about the impact of changes in guidance (click image to see tweet – NB 2012 guidance changes are not directly comparable with earlier figures). Rachel tweeted on climate change from discussions with Stuart Hay. This is a large topic in its own right, and of huge and increasing relevance to Public Health. I will ask Centre for Environmental Change & Human Resilience, University of Dundee (@CECHR_UoD) if they would like to host a future #PublicHealthHour on this topic. Chris talked about Dr Andrew Murray’s recent Genghis Khan Ice Marathon. Andrew uses endurance events, tweeting and infographics to promote physical activity and sport (click image for tweet on Ice Marathon). GoWell (@GoWellOnline), a 10 year research project looking at housing and regeneration tweeted about their research into the legacy of the Commonwealth Games (click map for tweet). This #PublicHealthHour with Chris Oliver was engaging and informative – a huge thank you to Chris for his time, preparation and patience with technology. The Webex brought better structure and discussion and much more interaction (retweets, discussion in the chat box and by phone). We need to reflect on recruitment and engagement ahead of future session. We had a relatively small number of participants despite dissemination of information to Public Health teams and on Twitter ahead of the session. As Chris pointed out in discussion following the session, the 90:9:1 rule predicts that you have to reach a lot of people for a little engagement. We will seek wider publicity eg through the Faculty of Public Health (@FPH), newsletters, team meetings, conferences and other routes. These #PublicHealthHour sessions are open to colleagues far and wide. Images from NNGroup. Click images to go to webpage. The next session will hopefully be on health inequalities (following poll – 16/32 for this topic). We’re exploring options for a guest presenter: 2 Mar 2016, 12.30. Follow @ScotPublic for more. *** UPDATE *** The inequalities session is scheduled for June (tbc). The 2 March session will be with colleagues from Glasgow Centre for Population Health, looking at assets based approaches, infographics and social media. More here. 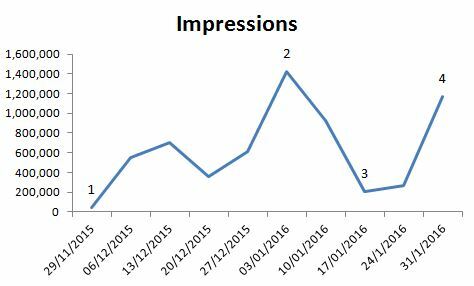 Since the first #ScotPublicHealth tweet in November 2015 we’ve had 6.6M impressions, 2,770 tweets, 720 participants and an average of 4 tweets/participant (after removing results of two spam accounts). That is a considerable reach and engagement. I have submitted #PublicHealthHour as a heath hashtag to monitor this too as this network hopefully extends beyond Scotland. We will, of course, continue fostering connections within Scotland too. There were challenges running this, our first #ScotPublicHealth Webex. It worked well enough for the #PublicHealthHour to run with a relatively small number of participants, but we have quite a lot to learn (eg it took us a while to work out how to mute callers when there was a lot of background noise). I have arranged a call with another team with considerable experience in Webex to seek their advice. We managed to circumnavigate challenges with browsers (eg work around for Windows 10). As host of the event I had to find a computer that could access Webex and allow a demonstration of tweeting (not aloud from a work computer). Working from home I had access to both Webex and Twitter, but didn’t have a phone headset. That limited my ability to tweet and interact during the session (tricky to do one handed while holding a phone). Twitter is becoming an important part of engagement and networking, so we need more open policies at work. We attempted this session with no additional support. It is clear we would need more input with larger number of participants (eg watching chat and tweets coming in, handling the telecoms, counting number of participants, taking screengrabs of whiteboards).